The event OBJECT_GET_PRE_SEND_DATA can be used to manipulate the server response before object data is sent to Pimcore Backend UI when opening the detail view of an Pimcore object. Imagine following use case: Products (stored as Pimcore objects) are organized in a certain hierarchy and take advantage of Pimcores data inheritance. An example would be the structure we use in our e-commerce demo application where we have three levels of product hierarchy: article, color variant, size variant. To minimize maintenance effort, certain attributes should only be maintained on a certain hierarchy level (e.g. product name on article level, color and images on color variant level, size on size variant level). In order to make this simple for the editors, they only should see the attributes they need to maintain on the corresponding hierarchy level. 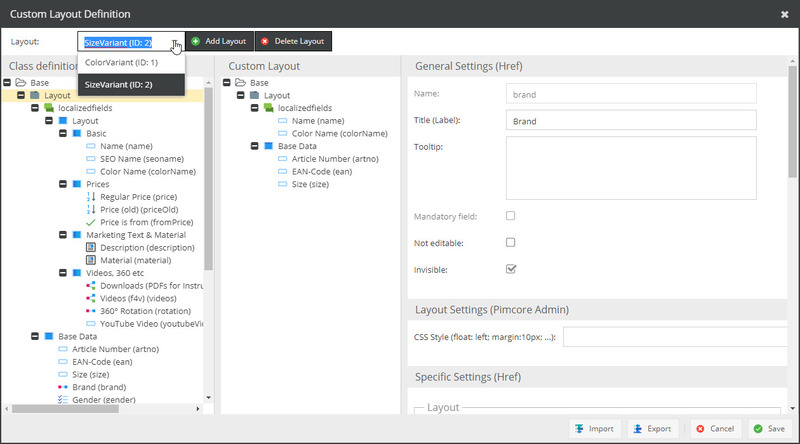 Create a Custom Layout for every hierarchy level.